The impact of this summer’s Google Reader shutdown is being felt in the Apple ecosphere too. Developer Silvio Rizzi announced on Monday that despite Google’s shuttering of its RSS service this coming July 1, he will continue development of his Reeder RSS app for both Mac and iOS after Google’s service is no more. 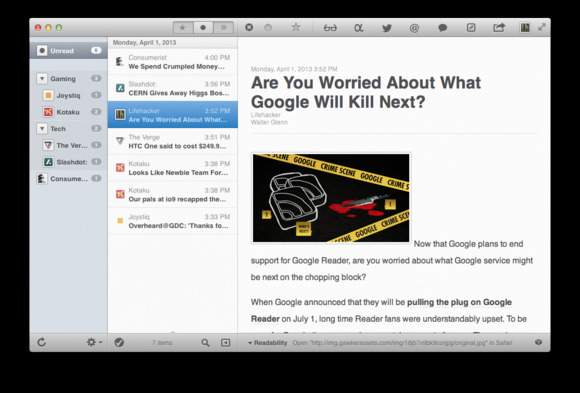 Reeder is a popular RSS reader for Apple’s devices, but it currently relies upon Google Reader as a back-end for serving up feeds and syncing them between devices. With Google Reader being put out to pasture, the hunt is on for many developers and users alike to find a new solution. In his posting on Reeder’s site, Rizzi said that the iPhone version of the app already supports other services besides Google Reader, and that he is adding more, such as Feedbin. Those enhancements will appear as part of the forthcoming version 3.1. Eventually, Rizzi plans to give users the choice of a number of different services, including the ability to simply use Reeder as a standalone feed reader, without need for a back-end service. Meanwhile, Rizzi has made the Mac and iPad versions of Reeder available for free on the Mac and iOS App Stores, respectively. (The iPhone version remains at its current price of $3.) The other editions will remain free until they’re updated to version 2.0 in the next few months, which will bring them into line with the iPhone version, complete with support for all the features that it will offer. The demise of Google Reader has been met with an outcry from many longtime users of the service, leading some to question which of the search giant’s other services might be next on the chopping block.